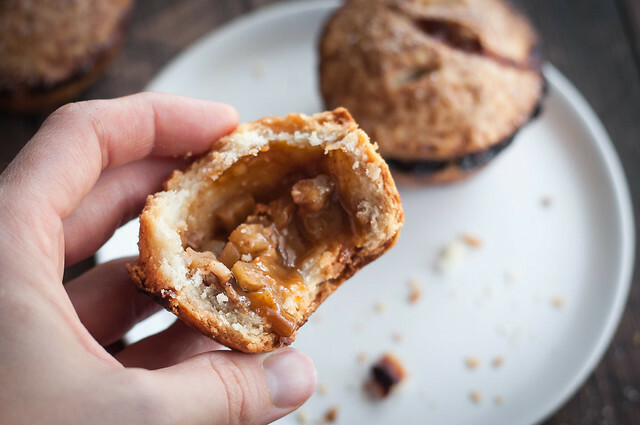 When I am eating delicious mini apple pies with the flakiest crust I’ve ever tasted, let alone prepared myself, having them in tiny format helps to avoid that unpleasant sugar (and waistline) response. I eat one, no problem. Then, yes, I want another one, but I definitely don’t want to eat an entire second little pie, and I don’t want to be the one who leaves the half eaten baby pie on the counter. Because that’s just cruel (to the pie). Pie abandonment. It’s also really easy for the only other member of the household to deduce the guilty half pie eater. Not a good scenario. I know because it happened to me during the pie photo shoot…it was for artistic purposes, okay? But, when you’re eating regular pie, it’s way too easy to let things get out of control. Because you can take that second sliver, which is followed by a third not-so-tiny sliver, and no one asks any questions because they’re too busy refilling their wine and just assume it was six people, not one, who downed half a pie after Thanksgiving dinner. This, also, is a bad scenario, so I argue that the only answer is to eat a single mini apple pie, revel (like this???) in every bite with its buttery, flaky crust, tender apples, gooey melted butterscotch, and just discernible drop of the hard stuff, then walk away satisfied and curl up in front of a fire or around the table for some board games. 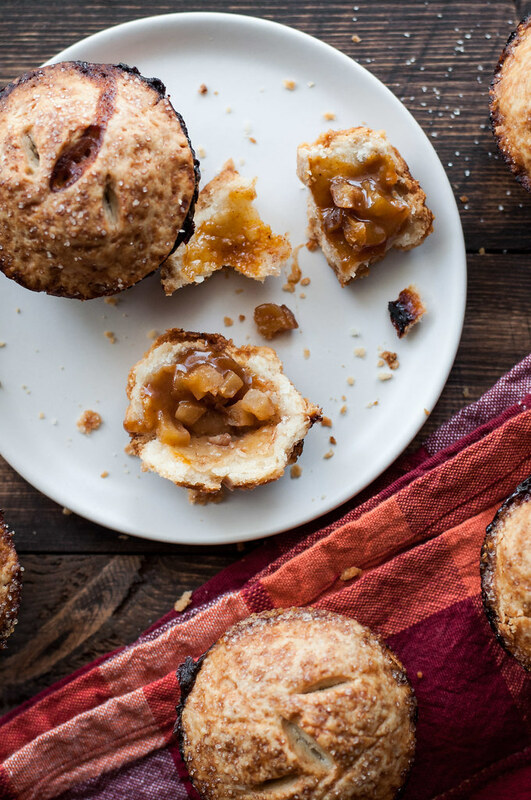 Moral of the story: mini apple pies are way better for morale than regular sized apple pies (and don’t even get me started on the adorable factor). 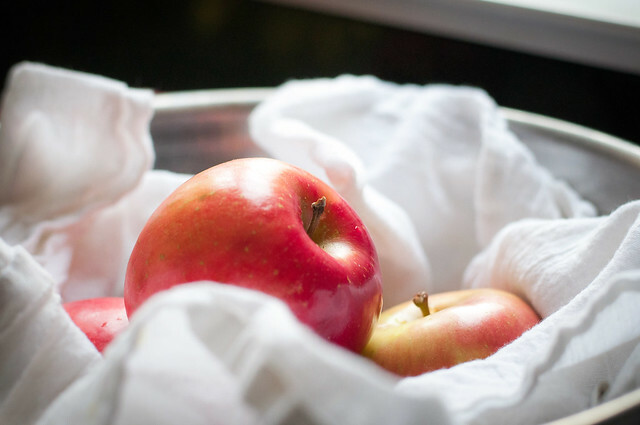 Lest I forget, besides a few tablespoons between the crust, filling, and topping and a handful of butterscotch chips, my mini apple pies rely primarily on fresh apples for sweetness. So you get your fix without even overdoing it on the sugar. What bit of sugar there is bubbles up and out of the vents and maybe out of the sides, if you’re lucky, forming a kind of toffee caramel bonus that even my caramel-hating hubby downed without questions. First of all, yes, he hates many dessert ingredients, but I’m on a mission to convert him. Second, do not judge that sticky sugar leakage by its very dark (okay, black) color. It can’t be helped. That’s just what sugar does when it bakes. 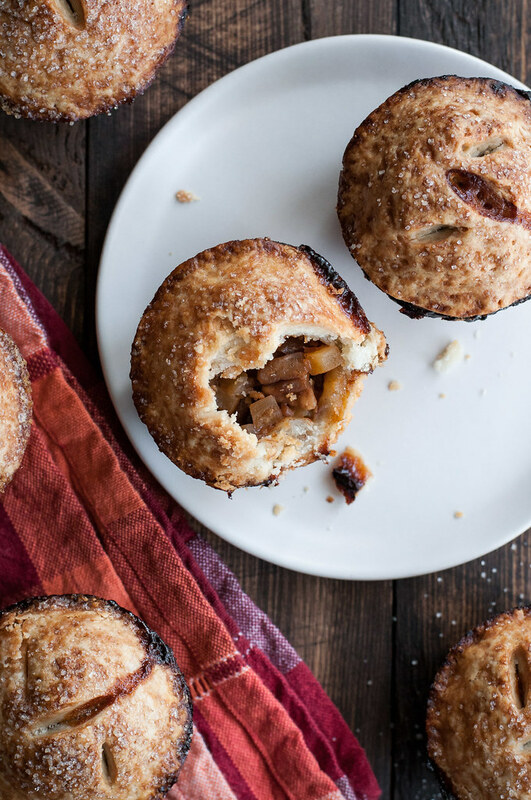 These little pies would be perfect for Thanksgiving or any other gathering, but you’ll need just a little time to set aside if you want to have success with the recipe. I’m hoping its length doesn’t scare you away. It’s probably a little wordy, but for those of you, like me, who have never attempted a galette-like tart dough before, the extra notes about what to watch for will help you get it right. I promise, it really isn’t that frightening. Just don’t second guess yourself if all is going according to the recipe. And if it’s not? I’ve outlined some expected pitfalls below and the cures for them. During my occasional baking, I’ve begun to understand something important about dough of any kind: many mistakes are, in fact, salvageable. In terms of tools, this is my set of circle cutters. They come with basically every size you need, and as of publishing this post, they’re on sale at the link (affiliate link). 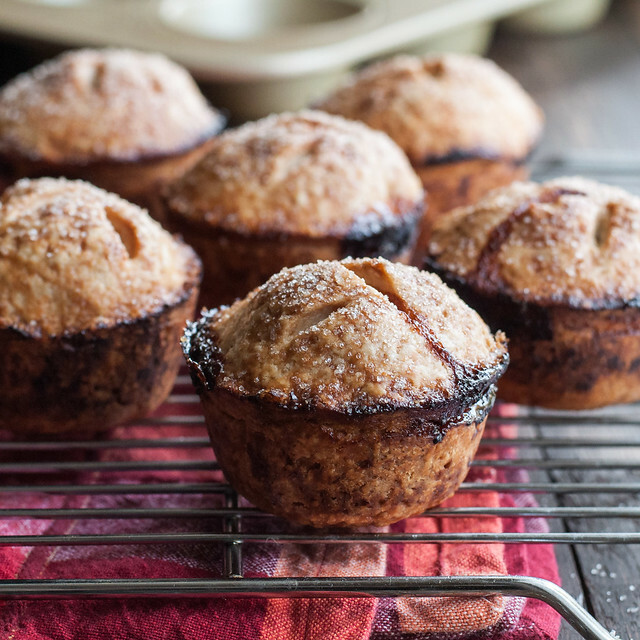 I love my WS goldtouch muffin pan, here. Seriously, nothing sticks to that thing, even if you forget to grease it (not an affiliate link). If you think you’re having a crisis or that you ruined the dough, take a deep breath. You’re probably fine. The most important tip: make the dough and cut out the rounds in advance. Since the dough is made of lots of butter, it requires refrigeration or freezing, then waiting, between every step. Roll the dough. Wait. Cut the dough. Wait. Cut more dough. Wait. Then wait some more so the dough is soft enough that it doesn’t tear. All while trying not to tear your hair out. It’s a little overwhelming if you’re in a rush, but try to resist the urge to mutter obscenities and make one giant galette, because mini pies are way cuter and you will awe your guests! 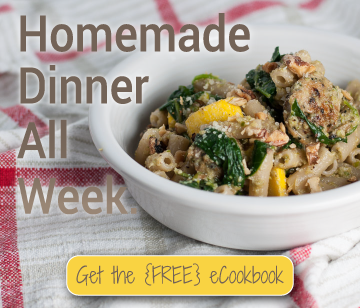 If you plan ahead, you can work on other cooking or laundry or a book while you wait on the dough. If, at any time, the dough starts to melt and get very slick (like butter), just set it in the freezer or fridge for a few minutes. If something goes wrong when cutting out rounds, don’t panic: roll it all up into a ball (kneading as little as possible) and place it back in the fridge until it’s cold but pliable enough to roll. If you start kneading and realize your dough is just too dry and not holding together, gather the crumbs and place in the fridge briefly. Return dough to the food processor and pulse in more cold water in 1/2 tablespoon increments. If the dough tears when building the pies, it’s probably still too cold. Patch the tear with water, then wait another 5 to 10 minutes before working with the rounds again. Working in a slightly cool kitchen with slightly cool hands will help you. Crack a window, unless there’s a blizzard outside. To make the dough ahead of time, it can be refrigerated or frozen at either stage: after kneading and forming it into a ball, or after rolling the dough and cutting it into discs. Allow time in the fridge or at room temperature so the dough becomes just pliable enough to continue with the next step. 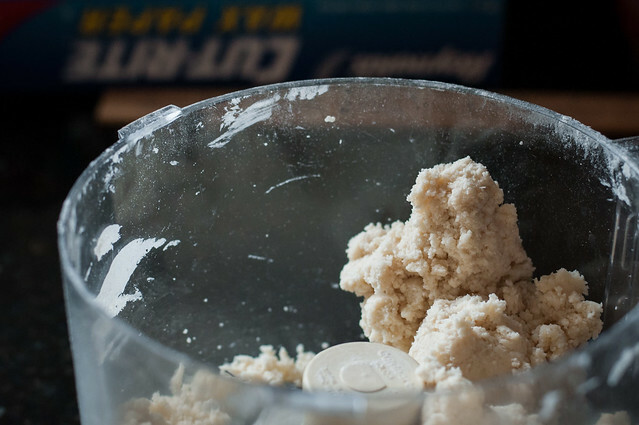 Dough should look like this when it’s done in the food processor. 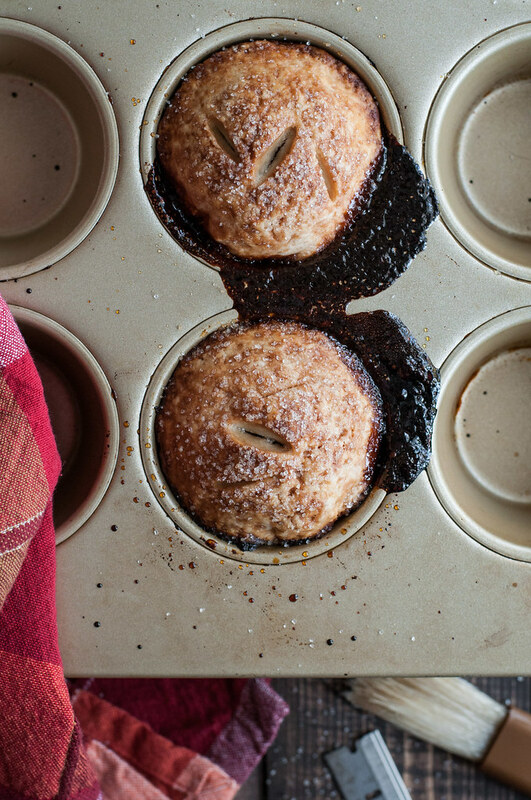 These little apple pies are all-American apple season perfection. For the easiest assembly, prepare the rounds of dough ahead of time, freeze them between sheets of wax paper, and thaw until just pliable enough to shape without cracking. 3 Fuji (or other sweet) apples, peeled and diced ¼"
If your food processor is large, make the dough in one batch. Otherwise, make half at a time. Quickly pulse flour, sugar, and salt a few times in a food processor to combine. Cut each unwrapped stick of butter into quarters lengthwise and crosswise (16 pieces per stick). Distribute butter cubes evenly over flour mixture in processor. Pulse in 1 second intervals until most of the butter is between small flakes and pea sized. Drizzle ice water over the flour and butter mixture about 2 tablespoons at a time. After each addition, pulse a few times. After adding all the water, process in 10 second intervals, 4 or 5 times, until the mixture holds together in big chunks. Pinch the dough to make sure it holds together without crumbling. If so, it's ready--don't mix it any longer than necessary. Turn the dough onto a clean, dry countertop. With clean hands, working quickly but carefully, press the dough into a ball. Grab a small chunk of dough from the ball, about 1 to 2 tablespoons, and smear it across the counter with the heel of your hand. Pick it up and set it aside. Continue this process with all the dough, piling the smeared dough together. Split the pile in half and form each into a rough ball by pressing it together with your hands. Place one ball between two large sheets of wax paper, and roll it about 3/16" thick. Roll the other ball, then stack them, still in wax paper, on a baking sheet and freeze about 30 minutes. Grease a standard size, preferably non-stick, muffin tin. Remove the top sheet of wax paper from each dough sheet and cut into pairs of 3½" and 3"rounds (the larger rounds will form the bottom crust). Stack the small rounds between sheets of wax paper and refrigerate. When pliable enough that they don't tear, line the muffin tins with the larger rounds, pressing them gently into the corners. The bottom crust won't come all the way up the side of each muffin well. Refrigerate the muffin tin while you prepare remaining dough rounds. Gather the dough scraps into a ball, refrigerate briefly, then re-roll between sheets of wax paper. Freeze 30 minutes, then cut into more pairs of rounds (you can see why it pays to make the rounds in advance!). Repeat until dough is used up, your muffin wells are lined with the bottom crust, and your top crust rounds are chilling in the refrigerator. Preheat the oven to 400 degrees. Set out top crust rounds so they become pliable. In a bowl, combine the apples, sugar, cinnamon, nutmeg, chips, nuts, flour, and bourbon. Let stand for 15 minutes (or freeze until ready to use). Distribute filling evenly amongst bottom crusts, pressing it down and piling it as high as it will go, without covering the top edge of the bottom crust. Use your pinky to dab water all over the visible edge of the bottom crust, then cover with top crust round and press edges together firmly. The water will help seal the crust during baking. Carefully (without bumping the top crust) pop the pan into the freezer or fridge for a few minutes. Brush top crusts lightly with water, sprinkle generously with sugar, then use a clean razor blade or sharp paring knife to cut three slits in each top crust, making sure to pierce all the way through. Place muffin tin on a baking sheet and set the timer for 45 minutes. Rotate the pan front to back halfway through baking. The pies may ooze out the top and even the sides during baking. The pies are done when the crust is a very deep golden brown, indicating that it's had time to bake all the way through. Cool the muffin tin on a wire rack for 5 to 10 minutes, then run a paring knife around the edge of each pie and pop it out to cool on the wire rack. Serve warm or room temperature. I found these to be just as tasty into the third day. To re-warm, wrap pies individually in foil and place in a 225 degree oven for about 20 minutes. Adapted from Dorie Greenspan's apple pielettes, in Baking Chez Moi. To get closer to 12 pies, roll the dough a bit thinner, about ⅛". It will be more sensitive to tearing, so if you're new to dough, err on the thick side. To avoid the air bubble between the apples and top crust after baking, you could substitute your favorite pre-cooked apple pie filling (with bourbon and butterscotch added, of course). Note: This page contains affiliate links. It does NOT contain sponsored content. Affiliate links (to products I recommend, on Amazon) offset my ingredient and website maintenance costs, so I can keep bringing you boozy recipes like this one. Thanks! You had me at bourbon. These look incredible!! I love the addition of butterscotch. Thanks Paige! I like my desserts gooey, and butterscotch definitely does the trick.